The recipient of the 2008 Technical Achievement Award was the late Dr. Larry E. Hochreiter. The award citation reads "In recognition of his significant contributions toward advancing the knowledge of thermal hydraulics phenomena and for his impact on the thermal hydraulics community as a researcher and educator promoting technical excellence and nurturing next generation nuclear engineers". Hochreiter's long career in nuclear engineering safety included serving as Westinghouse's safety analysis technical expert on the 1979 Three Mile Island accident and directing a Westinghouse analysis of the accident for the President's Commission on TMI. He directed Westinghouse's analysis team on the Zion/Indian Point 60-day study for severe accidents and initiated Westinghouse's efforts in severe accidents. In 1986, as a consulting engineer for Westinghouse, he directed engineers in developing a model for the Chernobyl RBMK reactor and performed independent calculations to verify the actual Chernobyl accident sequence. He was instrumental in directing Westinghouse's Full Length Emergency Core Heat Transfer-Systems Effects And Separate Effects tests program. The research and data resulting from that program continues to be regularly cited in emerging research and the qualifcation of thermal-hydraulic computer codes. He has worked on safety issues for Westinghouse's Pressurized Water Reactors and Boiling Water Reactors and consulted with the Westinghouse Savannah River Company and the Westinghouse Naval Division. His collaboration partners included the U.S. Nuclear Regulatory Commission, Electric Power Research Institute, Bettis Atomic Power Laboratory and many companies in the industry. He was a current member of a governor's panel overseeing an inspection of the Vermont Yankee Nuclear Plant, Vernon, Vt.
Hochreiter joined Westinghouse in 1971 as senior engineer at the Westinghouse Electric Corporation and became manager of Safeguards Development in 1972. He was appointed advisory engineer in 1977 and consulting engineer in 1985, both of which were management positions that focused on technical issues. 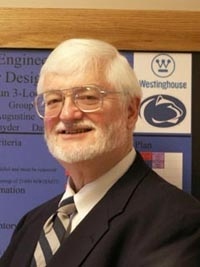 In 1986, as an adjunct professor, Hochreiter began teaching graduate courses in the Penn State/Westinghouse mechanical engineering program at the Monroeville Center, through the University's first extended degree program in nuclear engineering, and at the University Park campus. In 1994, he initiated a second master's degree program at the center. He joined Penn State's nuclear engineering department in 1997 as professor of nuclear and mechanical engineering, teaching undergraduate and graduate students. His research at the university focused on thermal-hydraulic modeling of nuclear power plants, reactor safety analysis and experimental studies of two-phase flow and heat transfer. He created a state-of-the-art reflood heat transfer facility where Penn State graduate students could carry out a variety of experiments in heat transfer, convective steam cooling and steam cooling with droplet injection.